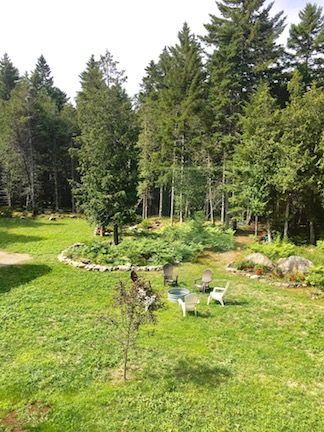 DESCRIPTION: True North is a private 20 +/- acre, beautifully landscaped hidden retreat on the quiet side of Bar Harbor. 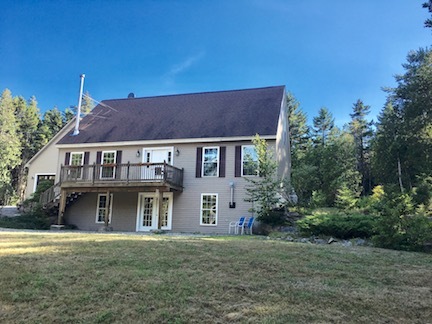 True North is within walking distance to The Nature Conservancy/Blagdon Preserve, a beautiful walking trail that leads to beaches, picnic area and a chance to see Maine wildlife such as seals, eagles, osprey, deer and much more! Long Pond is less than a 10 minute car ride for swimming, kayaking, canoeing, and paddle boarding all of which can be rented at Pond's End via National Park Canoe & Kayak Rentals. Echo Lake beach and Beach Cliff mountain hiking trail are approximately a 15 minute drive from True North. For a quick tour and a tasty bite to eat, The Atlantic Brewing Company is less then a 5 minute drive, a great place to visit and see how Maine beer is brewed and then have lunch at Mainley Meats a seasonal indoor / outdoor BBQ eatery. LAYOUT: FIRST LEVEL: Entrance into the sun room which has sliding glass door to the patio. Dining room, kitchen, living room, family room with a queen pull out sofa. Full bath with laundry. Bedroom with a queen size bed. SECOND LEVEL: Master bedroom with a king size bed. Full bath. Bedroom with a queen size bed as well as a set of bunk beds. LOWER LEVEL - UNFINISHED BASEMENT: Game room with a kids corner and access out to the front lawn.